If you are self-published, you have certainly made your paperbacks and ebooks available on Amazon. For your ebooks, you have probably also enrolled in KDP Select. But what happens when you make the decision to exit KDP Select and publish your ebooks with an aggregator such as Draft2Digital or Smashwords to gain access to Apple iBooks, Barnes & Noble, Kobo and others? It makes sense to want to make your ebooks available to as many readers as possible, and from the viewpoint of being an independent author, exclusivity goes against the grain of what being independent means. However, facts are facts, and as the graphic below from Author Earnings clearly shows, Amazon is very hard to resist. If you have ebooks in Amazon KDP Select and are wondering if it is advantageous to exit, let me save you some time by giving you my experience of having been in and out of KDP Select many, many times. I suppose the first question you might ask, is why have I exited so many times. Good question. There is no doubt that enrolling an ebook in KDP Select increases ebook sales. 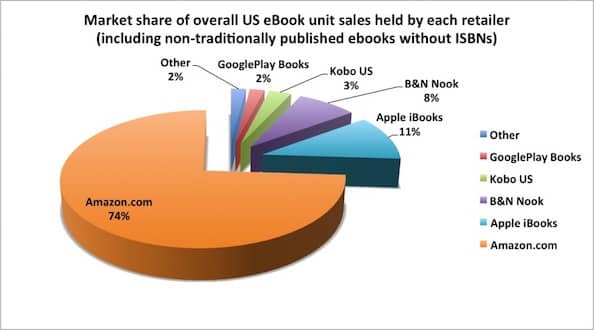 There is no doubt that Amazon sells more ebooks than any other retailer. There is no doubt that Kindle is the most popular e-reader. There is no doubt that I have sold more ebooks via KDP Select than via any other means. My ebook sales have always increased during the first 6 months of KDP Select enrolment, and then sales fade away to a trickle. If this had happened only once, I would have explained it away as being a problem with a book. But I have seen this happen over and over again, as I have moved eighteen titles in and out of KDP Select. Amazon wants ebooks in KDP Select because it uses cheap, free, and subscription ebooks as an ‘entry hook’ to get people to buy other products on Amazon. This is what differentiates Amazon from all other ebook retailers. Amazon is not in the business of selling ebooks. It is in the business of selling televisions, lawn mowers, pet food, laptops and any other profitable product, but Amazon uses ebooks to bring (lure) customers to its store. However, Amazon needs to reward writers for handing over exclusivity. So, the deal seems to be that Amazon hands out the reward of increased sales, but only for so long. My experience tells me that Amazon’s marketing algorithms stop working in your favour after five or six months. I have left a few ebooks in KDP Select for well over a year and a half to see if sales picked up after the first two terms, but they never eventuated. So this is why I exit KDP Select after two enrollment terms, and then open publish for three or four months. Then, when I re-enrol in KDP Select, I usually get Amazon’s marketing algorithms working for me again. And what happens to my ebook sales during the time I am out of KDP Select? Kindle sales continue, but at a much slower rate, and of course, there is no Kindle Unlimited income. Sales on other retailers cover this loss to some extent, however. In general terms, my Kindle ebook sales income drop by about 40-50% from what I usually expect from being enrolled in KDP Select. Over the years now, I have developed a routine of staying in KDP Select for six months, moving out for a while, then moving back in again. Each time I re-enrol in KDP Select, my Kindle ebook sales again increase dramatically again. Plus of course, I return to getting Kindle Unlimited page read income. Rinse and repeat. If you have ebooks in KDP Select and you are getting reasonable sales, stay there. If you are thinking about open publishing, be prepared for a loss of ebook sales from Amazon, which may or may not be offset by sales from other retailers. But if you are in KDP Select and have been enrolled for a long time, and have seen your ebook sales fall off and never recovered, perhaps it’s time to take a break from KDP Select and move to open publishing for a while and then try KDP Select again in a few months. Related reading: Are Your Amazon Books Merged On Your Book Sales Page? Thank you so much for the excellent data. I’ve been rather schitzo on this strategy myself. But, now I have a plan. Thanks! Glad my experience helped you a little, Harold. Good luck! Thanks for a thoughtful, logical approach rather than the standard “Amazon is evil” approach I see a lot. This makes sense and also matches my experience. Now to see if I missed my window for this term…. Amazon does what it does, well. But always untick the Select box, Lisa! Keep your options open. Great post Derek, and timely as I think about my own plans for my book. I have a question. Do you lose the reviews you have gained when you move from KDP Select to other retailers, and then back again? If so, is there a way you handle that? You reviews stay on Amazon, Julie. When you leave KDP Select, your ebook is still listed for sale as normal, so nothing will change. I can’t be as sure about other retailers, though, as when you return to KDP Select you have to unpublish on these retailers. I hope this helps. Great approach and advice to a very difficult decision us self-published authors make! The only reason I may go with Smashwords first is because my book contains pictures and may result in me losing royalty gain because of its size. Good idea or is KDP Select the best route to take when starting out? Thanks Derek – most useful! 1. Still run a free promotion on Amazon just by changing price to zero? 2. When you promote your title that is available on itunes, b&n and kobo – do you include links to those retailers, or can you use someone like Draft2Digital to handle non Amazon sales. 1. No. Once you are out of KDP Select you cannot promote free Kindle ebooks. Nor can you reduce your price to $0.00. The price minimum is $0.99. 2. Yes, Draft2Digital universal links is a very good way to promote books on all your retailers. Very timely and useful article. Any thoughts or advice on the ease or not of getting books onto Kobo or iBooks? Hi Nick. I use Draft2Digital to publish on iBooks and Kobo. It’s very easy. You can also use Smashwords to do the same. But you need to choose one or the other to avoid duplication. One thing to remember is that getting a BookBub placement is (supposedly) easier if your book can be bought in multiple places. But they won’t accept books without a decent number of reviews so it makes sense to start with KDP Select and then move out of it after 6 months or so. In what way exactly does enrolling a book on KDP Select automatically “boost sales”? Your article provides no explanation of it. I have heard of books that have been put on KDP Select and yet did not make a single sale.